Here’s a heat map of the witness sightings for the March 22nd, 2013 Northeast Fireball. Click map below to view event sightings page. 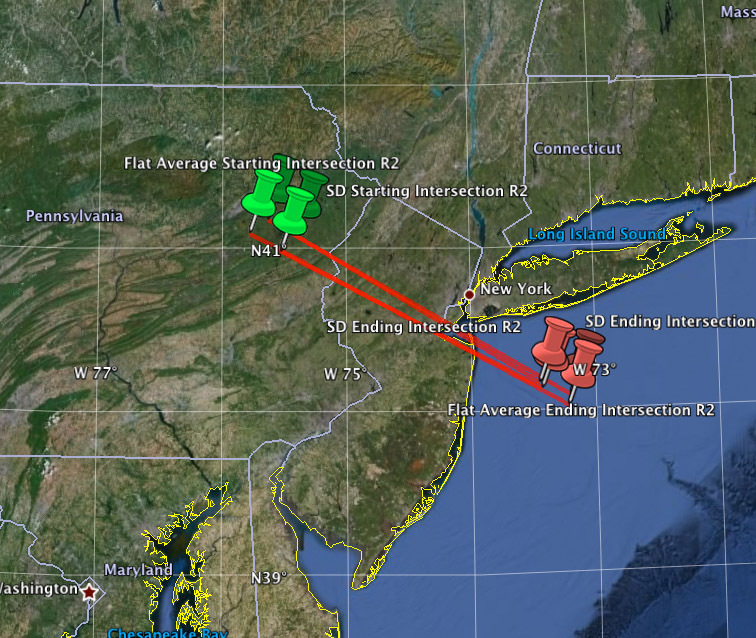 Here’s an estimated trajectory model for the meteor spotted in the northeast earlier tonight. This model is calculated by computing the intersection points of each witness with all other witnesses. These points are then averaged for the starting and ending points of the meteor. Click map below to view event sightings page. Mike Hankey is a software developer, entrepreneur, amateur astronomer, astrophotographer, meteor observer and meteorite hunter. Mike's enthusiasm for meteors led him to the American Meteor Society where he volunteered his time and the services of his software development company to redesign the AMS website and fireball reporting tool. In 2011 Mike was awarded the society's C.P. Olivier award for his work. In 2012 Mike was promoted to the role of Operations Manager. Mike and his company continue to maintain and enhance the AMS website and fireball reporting tools. You can see Mike's photography work and read more of his posts on his astronomy blog: MikesAstroPhotos.com. Mike can be contacted here. Well everyone, I live in Fleming Island, Florida and I am about 20 miles southwest of Jacksonville. Last night at just about 8pm I was entering my neighborhood and I saw a big orange ball in the sky moving slowly across the sky that got brighter and brighter, then it started to dim and I watched it for about 5 minutes until it disappeared. I don’t know if it was the same thing that everyone else saw, but it wasn’t an airplane. There weren’t any red or green lights as it increased in intensity. Hi..I live in Manteca Cailifonia.. At around. 2100 last night March 23rd Western time.. I went out in my backyard.. I looked up in the sky and seen the samething. Three very bright orange slow moving objects… the first set lasted about a minute then slowly. Faded out…then two more sets of three..lasting around the same time.. It diffently was not planes…their happened to be a plane in the sky at the same time… Weirdest thing I’ve ever seen.. I was able to take pics..I’m hoping they came out. I live on Long Island and while I was taking a walk last night I suddenly heard this whooshing sound while seeing a bright aqua colored light in the sky. In the next instant I saw this meteor shooting to the south. It was very low in the sky and I could actually hear this object as it passed overhead… Very strange to say the least.. I saw a blue green fireball at about 7:45 March 22 in West Alexander Pa. Could this be the same thing or was I too far from the east coast siting? Yes, this was the same fireball reported along the eastern coast from Maine down to North Carolina. I was walking my dog at dusk, when suddenly the area lit up like someone had flashed a giant strobe light. I looked straight up in the sky and briefly saw the streaking meteor moving from west to east. It was gone in a second. The time was approximately 7:54PM EDT. I an located in Franklin Park, NJ. Mike you need to move your trajectory a bit south. Saw it in West Grove PA. Not sure if it was the same or if it was a split off from the meteor in NY. But a stadium full of people saw it during the high school lacrosse game. Saw it around 7:50 PM driving south on Interstate 91 a few miles before the exit to interstate 90 in Mass. The duration was several seconds – very unusual. It streaked horizontally from west to east. Thought it was a plane landing. It started out white the glowed green with pieces falling off that appeared white or golden. I haven’t seen a fireball like this in decades. I live in NE Maryland. I also saw a white fireball high in the sky traveling west to east that broke up into pieces that turned green, yellow and red before. I thought at first it was a military cargo plane with its headlights on which is a common site but it was traveling to fast for a plan but seemingly slow as well for a meteor. I realised it was a meteor/fireball when it disintegrated into colorful pieces. I live in Central New Jersey. Before 8, I was getting things out of the car. Everything lit up in 2 quick flashes all around. I looked up. I thought it was a transformer sparking or something else. Looking at the news, it seems like it was something much cooler. 5mm at arms length headed down and west then changed direction to up and NW. saw in logan twp. NJ at about 7:50pm same bright ball and heard a burning noise just over my house. Saw one that was so close, I heard it hit the water. My wife and I were driving east on rt 155 toward Havre de grace, ,MD when I saw what appeared to be a horizontal streak of light traveling what seemed to be twice as fast as the car west toto eastdrive with slightyou decent and lasted about 10 seconds around 7:48 pm. Caught my eye . I saw it at about 7:50-ish…walking down the street in Bedford Stuyvesant. It was amazing and I was so sorry I was all alone because I thought I had lost my mind!!! Simply beautiful! Around 7:55-8:00pm my boyfriend pointed it out and thought it was a shooting star. It was much bigger and closer to earth than a shooting star would be. It was very big and a green color with some gold in it. It lasted a few seconds before it disappeared. We spotted it In south jersey right outside of mays landing. Saw it driving out of atlantic city, nj around 19:55. Brilliant display! Thought it was lightning at first then saw it zip through the sky with pieces falling off. Amazing!! I was driving towards north in Philly when I saw it go west to east around 7:45. At first I thought a plane was going really fast and flying very low. But it looked like a large ball of fire with a range of hues. I remember blue was more pronounced. Witnessed this green fireball split in two then fall disintegrating through the atmosphere in southern York county in PA. There was one on the East Coast back during the week when that one hit Russia. The problem was that it was so overcast that no one saw it except me (that I know of) – I got lucky and it shined through thin cloud cover just as I looked up. I watched it zip slowly across the sky in Weyers Cave Virginia. BEAUTIFUL!!!! I KNEW IT!!! Most Scariest THING I EVER SEEN!!! I was walking in A Open Parking Lot When I seen something fallinG from the sky with smoke trails then it burst!!! All I could Think about was This Looks like the thing from Russia!! When It Burst I Ducked Waiting for The BANG but There wasnt any!!! I was In SHOCK for the next 30 Mins!! People at the store asked me if I was ok but when I told them They looked at me like I was crazy!!! (maybe thats because I was at a liqour store)But at 7:57pm I Posted On FB that I swear I seen something Just fall from the sky!!! I KNEW IT!!! I was pulling up the driveway in Monroe, NY and saw it go from West to East almost like fireworks, first thought a shooting star, which I’ve seen too, but it was to bright, big and low in the sky, and shooting stars are as quick as a blink! Quite fascinated when Janice Huff from News Channel 4 New York @ 11 said oh yes it was a meteor!! I saw it in East Bridgewater, MA, as I was in my parked car ~ it was very low in the sky (bluish/green). It was going west to east. I saw the meteor/ fireball also at approximately 8 pm breaking apart in multiple pieces moving Northwest to East. I did not see any coloration other than bright white. It looked like sparklers on the 4th of July as it seemed very close to Earth. I was in Riverdale NYC as a reference. Spotted the metor from North East Maryland 21901. At first since it was so green I thought it was a military plane. The green light looks like the green navigation light on the aircraft. We watched it for about 5 sec. Amazingly bright green flash. Saw it moving west to east in southern sky in South Amherst, MA just before 8pm.Never saw one before – beautiful! I couldn’t believe my eyes, but when the car in front of me stop I knew I wasn’t crazy! Last night I saw my first ever meteor! I was driving through Monkton MD. It was amazing!! I saw it at that time as well, I was in Monmouth County camping about two miles south of Englishtown. It appeared to be right over our heads. The ground around us lit up, and I almost thought someone was shooting a roman candle firework over our head. Reminded me of the Perseid Showers several years ago. It brightened up, and then died out as it broke up, heading in the general direction you have identified. It ran a whole gamut of colors. I also saw the it driving from work in Ashland, Va.
My son and I were driving on I-95 south, about 20 minutes south of Portland, Maine, when we saw the same thing that knowitall described. What seemed so unusual was how straight the trajectory appeared , the change in color (white to green) and the breaking into particles as it disappeared. Very exciting to see. I was about 10 miles north of you Hodding on I-95, just outside Portland. Your description matches very well with what I saw. It appeared to have a very level path – and at first I thought it was a plane circling out over Casco Bay to make its final approach at the Portland Jetport. Then it turned green and broke up! I realized it was a fireball, but still imagined it was fairly close – perhaps over southern Maine. Quite amazed to learn it was somewhere over NJ/NY when I was watching it. Just got off I-95 in Ridley, PA about 7:50pm driving East on McDade Blvd when I saw a green glow in the north east horizon, thought it was an electrical transformer blowing at the time. We saw it just before 8pm in Lititz, PA. First the kids spotted it then my husband and I saw it. Amazingly bright and seemed so close or was just rather large. Then again, I am not trained in such, but it was unlike any meteor shower I’ve ever watched. My family observed this streak across the night sky which was white, yellow, greenish with a long blue tail. We were driving in the area of Pennsville, NJ, exit 1 off of Route 295, around 7:50pm. It happened so quickly we were unable to take a picture. We saw the fireball at the barn while feeding our horses last night around 8:00 p.m. in Jefferson, Maryland. We thought at first it was a shooting star since they are seen sometimes in that part of the sky until we saw the color and the size. thought so! Was driving on pa turnpike east from warminster area to nj at 7:45-8:20pm. ..did not check specific time but saw a quick streak out of normaly airline trajectories as initially the off color attracted my peripheral vision enough for me to look..but it had turned off white to whitethat quickly! Glad I know now it was a larger sighting! How can you be sure it was a meteor? I doubt that it was. But if it was not, what was it? Saratoga County in upstate NY at around 745 PM March 22, 2013: Saw a bright green fireball moving very fast horizontally through the sky on a southeast trajectory. It broke apart, scattered bright green pieces then fizzled out. The tail was red. Meteorite??? From Carroll County Maryland. Started at about 1:00 position, Traveling West to East at about 20 degrees above horizon and dropping to about 10 degrees at about 3:00 position. Observed 2 breakups. At about 7:50 pm, March 22, I saw a bright white light over the NIH in Bethesda, MD. AT first I thought it might be a helicopter, but then realized it had a long white tail, and was glowing a greenish, blue color. I was with my dog in an open field and was able to watch it for awhile until it burned out or disappeared. It was about the size of a large grapefruit. I saw the meteor in Staten Island, NY (south shore) at approximately 935pm last night. About 7:50, driving North on Rt. 895, Harbour Tunnel Thruway, in Baltimore, saw a bright green fireball streak low in the sky – I was on the bridge above Baltimore – it was going west to east. I thought it was a flare or weapon. I came out of a jazz concert in Holyoke, Mass somewhere between 9:30 and 10:00 on 3/22. Looked up at the clear night sky, facing south and saw something very bright and moving very fast from east to west that quickly disappeared and ended in a beautiful trail/tail of light. had to have been a meteor. what else? I seen this around 8:00 pm. in French Creek West Virginia. Why are wee seeing more meteor events in recent months? Are these really meteors? Saw it last night around 8 o’clock on 64 east near Nashville NC. Wow! Wow we saw it at about 7:50 too. This morning I went outside to look for it because it landed near our house. Luckily I found a good sized piece I think. I spotted the meteor while at the Tanger Outlets in Rehoboth, DE….it was awesome!! I saw it last night as well. I was in Adams Mass about 755pm. It was very bright and green. I think a piece of it broke off over the town. A small piece broke off and fizzled out right overhead. It mad a boom sound as well. I feel luck to have observed it. Ill go play Powerball tonight!!! Ditto to Sharon Bs description but witnessed in Baltimore County, MD.Same time frame as others. It was amazing! An airplane flew over a few seconds after the sighting. Sitting in my hot tub about 7:55 last night in Mendham NJ and saw a beautiful streak of light with green and orange! I saw a fireball streak above NYC at 3rd Ave and 31st at 8pm – it was heading east. Saw it in Canton MA. Low on the horizon moving North to South, with pieces falling off. a picture? anybody get a good pic? Waldwick, NJ – My 4 year old daughter and I were putting the trash out sometime near 8pm. It’s a fairly dark street at night so it lit the driveway up with a blue / green burst. I initially thought it was a firework as it was quiet colorful but soon realized it was a large shooting star. Very lucky to see it! I saw it while driving down my road to go home last night, in North Greenbush, NY- a big green streak -beautiful! I saw this last night around 8pm right after getting out of the rock climbing gym in Manassas, VA. It started out looking like a whitish/golden firework, crossed the entire sky and turned green as it crossed farther east. It was visible long enough for me to take notice, tell my climbing partner to look up, and for her to stop what she was doing and see it. Really glad I not only saw this, but also that I follow an astronomy enthusiast on Instagram who referred us to this page. did this happen to land anywhere maybe in the ocean? Very nice job with the new flight model and visualization tools! my 15 year old called me about 800 pm on march 22 2013. He told me he was out side with his friend and he saw a white glowing ball looking thing going threw the sky and he said it look like it explosed and he saw flames coming out of it and then it was gone. This was seen in Jessup Maryland. I saw this last night around 8 pm when I was walking my Siberian in an open field in Phoenixville, Pa.[Near Valley Forge]. It was AMAZING!! Very bright and traveling parallel to the Earth from the North to the South East. I never saw anything like it,,much different than any shooting star or meteor shower I have seen! It appeared to be at a low altitude. I am so glad I saw it,,,,,,,just wished it lasted longer than 6 or 7 seconds!! Have you considered that this fireball might actually be a probe-droid sent from an Imperial class Star Destroyer. Spotted the meteor as a green light coming from the South-South East heading in a Westerly direction from Winthrop MASS, across the harbor from Logan Airport. It was on a steep downward trajectory faster than anything I had every seen in the sky. Being so close to the airport, and the trajectory, I thought a plane was heading directly into the water. I saw this light for 7 seconds. , and neither has my daughter, who is 9 years old. It was amazing, and we were thrilled that we were outside to see it. saw a bright streaking fireball with bright white at the front similar to airplane lights with streaks of green and blue following behind it…. was in downtown Waynesboro PA,,, it was amazing to watch… it seem went down somewhere close to Waynesboro. Wish i could have seen it on the ground as well ! Looking northeast from Powells Fort Valley, I thought I was seeing a plane crash onto the east-facing slope of Massanutten Mountain (the other side of the mountain from me). I didn’t think it was a meteor because it was moving so slowly, just above the tops of the trees on the mountain. A co-worker and I were standing outside our office about 9:50pm when we saw what appeared to be a small piece of debris burn up over the office. It was bright and changed colors before it burned up completely. I stepped out onto my front porch and looked up just as the first bright midstream flash occurred. Since the color was greenish, I thought it might be fireworks at first. Actually had time to figure out that it wasn’t. I assumed from the color that it was some sort of space trash coming back into the atmosphere, as I have only really seen silver and gold versions of the phenomenon. Have they established whether it was natural or man made yet? seen it too in Norwalk CT.
My husband and I saw it on our way home last night around 8p.m. It was an amazing sight, beautiful ball of light with a streak of tail light. It passed so quickly I didn’t have a chance to take a picture. We are from York, PA. Researched something on a hunch; the 2x solar panel covers from the recent launch of Dragon on the CRS2 mission are still in orbit and were in the vicinity of the US Northeast last night around 20:15 EDT. The direction of travel would have been SW-to-NE for reentry, however, but the timing and size of the objects were about right. Calculated this with updated Space_track TLEs and Orbitron. Were there any reports of flashes experienced earlier in day – mid afternoon? Witnessed bright flash but dismissed it as seeing things. After confirmed evening activity am curious if anyone else saw something as well. Saw meteor around 7:55 pm in Vienna, VA. Resembled roman candle firework/fireball streaming across sky and toward ground. Could clearly see blue-green fireball disintegrate into a trail of yellow sparks. Saw a bright surge of light looked up to see it streaking across our second floor window in the great room. I looked to the right upper window to see it streak across but it was lower. It caught my son’s attention and he turned to look out back. He said it must have been a transformer exploding. As I took him to a birthday party and drove in the direction I saw it I was curious to see if any houses were without electricity. All was fine. A woman was on her porch looking out over the fields and I looked across and saw a bright blue flamelike brightness way off in the distance in a field (ground level). Couldn’t figure out what it was and my son wanted to go on to his social event and there were no accessible roads to go in that direction so I just drove around to see if there was any emergency activity in the area . Nothing thought it was my imagination and woke up to find the buzz on the sighting! I live in Northeast MD. I was traveling on Rt. 32E just past Rt175 exit. The road turns north at that point. Just before the road turns east toward Rt 170 exit, I saw it come from the West. A white, blue, green meteor traveling slowly across the sky with a long tail/trail. It lasted a good 10 seconds and seemed to be close like only a 1/4 to 1/2 ,mile away. It seemed to be mostly blue and green. It did burn white at times, and it went to the East. I could sware it seemed like it was right neer us and not up toward NJ. It was the most beautiful thing I have ever seen. I tlooked like if it was any closer it would hit us. As it travled east, it looked like pieces broke off and it burned out. Saw in Waldorf MD around eight. Looked very close, huge, and a bright beautiful blue color. Around 8 PM as I was driving home last night (Long Island, NY) I saw a bright light in the sky. At first I thought it was a plane but once I got a good look at it I realized it wasn’t. It had a bright white light with a bright green tail streaming very quickly across the sky. Suddenly it just disappeared. I live in Texas and last night around 8-8:30 I saw something that looked like it hit the ground and then turned a bright neon blue/green light then it went out. I thought it was a transformer or something but it seemd to have been to big and bright for that. It would be nice to know for sure that it was just a meteor, and not anything else. I was sitting on my sofa and saw it out the picture window in Smyrna, DE – it was a bright white fireball with an orange glowing trail. The COOLEST thing I’ve ever seen! I started yelling for my husband to look which panicked him as he thought a plane was crashing or something. By the time we ran outside it was gone – maybe 2-5 seconds. It was so fast that my husband only saw the tail end of the trail as it disappeared out of site. It looked like it was only 500 feet up, although that is not the case. Pelham, NH – Bridge St -in the Western sky a bright green light with dark tail. Initially thought it was fireworks but the trajectory was not right. We settled on little green men invading. LOL. My son saw it last night around 7:40 p.m. he said it was green and I thought he was exaggerating a little, now I know he wasn’t. I wish I could have seen it too. We live in rural N.C. so it was bright. I saw it when I took my dog out last night. I’ve never seen anything like it before. I’m in CT. Saw this last evening over Moultonborough NH, I viewed a large greenish object flying through the sky and had no idea what it was. Phoned our local police to see if anyone else had reported something, and no one had….it seemed I was the first. Then I read all the reports. It was astonishing! I saw a bright meteor at about 9:45pm. north of Newtown PA. I didn’t know about the earlier one? and dropped down sharply towards Merrimack river. Saw this last night as well. As silly as it may sound, it reminded me of green fireworks being shot up. Only it was just one and there was no loud boom. Thought I was seeing things at the time. Nice to know you all saw it too! Several of us saw this in Chambersburg PA. Awesome! Saw the fireball from my backyard in upstate NY (just west of Albany). I wasn’t sure what it was at first, as it was too low in the sky and too bright to be a shooting star. It looked more like a single firework rocket with bright greenish-white tail and dramatic burst at the end. Also had a bright, smaller burst in the center of the tail. The whole thing lasted just a couple seconds. Because it was so low in the shy, I thought it was closer to my location — very surprised to find out that projected actual path was over NJ. While driving in the city of Passaic around 9:45pm, I saw a fireball shoot across the sky, it was pretty cool to see. first time ever to witness one of those. Saw a big bluish streak fly over NYC between a few buildings and everyone on the street freaked out/had a moment together! Pretty cool! My husband was walking the dogs in the woods with only moonlight to see by when this thing flashed overhead. He said it lit up the path! We are in Barnegat, NJ. Saw this from Westport, CT.. huge and sound-less. A friend & I saw a smaller meteor at @10PM over Coatesville, PA. Seems like there was more than 1 meteor last night. I saw this fireball at 7:55 pm in central Massachusetts. It was a vivid green, purple and white and lasted about 5 seconds. Truly spectacular! Best meteroite I have seen in over 40 years! Moving horizontally NW to SE rather low in the sky about 15-20 degrees above horizon. It appeared blue to me like a fireworks display. I saw it for about 1-2 seconds then it appeared to explode at the end with pieces shooting off as from a fountain. I was looking for comet PANSTARRS at the time. (I never saw the comet). This was in Cranston, RI. March 22, 2013 about 7:54PM EDT. I just saw a shooting star fly over my house! There was a flash of light and I looked up and saw a streak of light leaving a red trail sail over my backyard at about 1000 feet altitude. it came in from the northwest and flew southwest towards the ocean. It made no sound. This is the first I’ve ever sighted over Rumson, NJ. I live in Atlantic County, NJ. close to Mays Landing and went outside to call my cat and to my left I saw flashing lights. I looked to my left and it was streaking throught some clouds and clear sky. With a tail that was not solid but dropping fireballs. I saw it for about 7 or 8 seconds until it just burnt out. Awesome! Just wish I had my camara! Most folks reported the initital “fireball” at around 8PM EDT. I was left my office in Chantilly, VA at about 8:25 EDT last night. At about 8:45-8:50 EDT I saw what was appeared to be a meteor trail in front of me (I was travelling due East on The Dulles Toll Road at that time) that was approximately 50 degrees up from the eastern horizon. The trail was hot white. It’s imprint apepared to cover about 5-10 degrees of the sky before it rapidly disipated. No other “celestial” objects were observed during the remainder of my commute home. To AMSADMIN – With over 500 sightings, I doubt this little correction to my report will matter. But, when I saw the fireball from Maine it was moving right-to-left – not left-to-right as I reported. Just a bit of a brain-freeze when I filled out the report form. What’s going on, there are fireballs everyday now all over the place. Is there something the government isn’t telling us? I live in Hughesville, Maryland and saw the meteor around 8:00 PM last night. I was getting ready to walk my dog and caught it going across the sky. It had a tail and presented an awesome sight; I was transfixed by it. I watched it till the lights/fire went out, which was around 3-4 seconds. I mind went to the Russian incident, and I immediately thought of the nearby Calvert Clifts Nuclear Power Plant. I have seen shooting stars / meteors before, but this was the longest in duration. I saw a glowing yellow orange spherical shaped object with a tail streaking across the sky last night sometime after 7:00 PM in Stamford CT. It appeared to be on fire or definitely glowing like a Roman Candle with a very straight trajectory. It traveled for a quarter mile or so after my initial sighting than just fizzled out and it did not appear to be that high in the sky. I thought maybe someone was shooting off fire works of some sort but it was to high and flying to parallel with the ground to be fireworks. Debris field looks like Edison,NJ to Middletown,NJ. I was driving east from Upperville, VA to Middleburg, VA on Rt. 50, at a little before 8 pm. I saw a beautiful greenish light with a tail going downward at an angle that is common for planes to fly into Dulles (and on what appeared to be a standard airplane flight path). So I thought it was an airplane in trouble or something. It wasn’t going much faster than an airplane from that distance. But the light appeared larger than what would have been that of an airplane unless on fire. The the light went dark. I expected to see a crash site on the news. Obviously I was wrong with my guesses. Finally, my guess was that I had seen a meteor or small asteroid falling. It was much bigger and and much slower than other “shooting stars” I have seen. My husband and I saw it in Winthrop,Maine around 8:00 Friday night. It looked like a big ball of white going through the sky. . Saw it streaking from west to east on Mar 22 about 8pm in Great Barrington, MA. Very large white fireball with red tail. Spectacular. It was beautiful. A bright streak across the sky; with sparks following at the end. It looked REALLY close. My husband and I both said; WHAT the heck was that?? My fiance and I observed this streak across the night sky which was white, yellow, greenish with a long blue tail. We were sitting in our backyard, around 7:50pm. It was so amazing, seemed like it moved fairly slowly but we were unable to take a picture. We are located on Long Island and it appeared out of the northwest and streaked in a southerly direction. YES GUYS I saw this most amazing, beautiful red-orange-blue-then white light running across the night sky about 8′ oclock EST in Long Island New York, It was so wonderfullly to witness and has been making me feel so happy. I didn’t see the fireball, but is there any reports of hearing a loud noise from this meteor? I live in Hillside, NJ (Union County) and everyone at home heard a noise originating from outside about the time this occurred. I thought maybe it was a car accident down the street at first but there wasn’t one, but now that I saw the news on the fireball, could it be a sonic boom caused by the meteor? Passed over the ridge in area of the Mountain house resturant . We were driving home after getting something to eat when right in front of us there was a big ball of blue, green light, we even saw the flare up it had half way before it disappeared……..awesome sight!!!!!! It looked like someone was shooting off a firework but backwards. I seen this over the allentown pennsylvania area. it was heading south east from my position. it was truly a bright display, with a blue/white trail. beautiful actually. I saw this meteor around 1am saturday morning in South Range, Wisconsin. It was bright green and went zooming across the sky and then disappeared behind the trees. It was awesome to see, especially since I’ve never saw one before, and thought I was seeing things!! We didn’t see the fireball (I’m jealous! ), but today we heard at exactly 3:49 pm ET in WV a spray of objects that sounded like dust and marbles tossed on our roof: my husband and I were in different adjoining rooms and both heard it! After accusing each other then the neighbors (all innocent) of pulling a prank, we rigged a magnet to some rope and dragged the gutters for micrometeorites, and found a collection of 3 grams’ worth of micrometeorite material in the gutter beneath! Our gutters and tiles are nonmagnetic, BTW. I was on Pennsylania Avenue going towards District Heights, Md. I saw something in the sky which I thought was a falling plane or something on fire. As it got closer, the shape of it began to change and then I could tell it was a meteor. A big ball of fire came down right in front of me, and then, it was gone. I am still trying to get over it. I’ve been surfing on-line greater than three hours today, but I never found any interesting article like yours. It is pretty price enough for me. Personally, if all web owners and bloggers made excellent content as you did, the net might be much more helpful than ever before. I live in the little town of Jacobus PA 5 miles south of York PA. I was hanging wash out on the clothes line just before 8 PM when I looked up and saw a fireball with a green tail traveling west to east. It only was visible for about 15 seconds or so. I witnessed a bright green “shooting star” with a long tail, it seemed to move fairly slowly and was quite “low”. I at first thought it was a firework?….bottle rocket …out of the corner of my eye, due to the color….but, well now I Know! It was beautiful! I live in East Greenville, PA …60 miles NW of Philadelphia.